On November 21, 2001, I publicly provided the following discovery with respect to Rosemary Willis's Zapruder film documented, clearly seen, ultrafast, second head snap. Whatever it was that caused the ten-years-old girl's first slowing then stopping and measurably slower head turn reaction from Zapruder film frame # 190 to 213, her first reaction is not the most important Zapruder film documented reaction with respect to Dealey Plaza assassination very close witness, Rosemary Willis. The most important documented reaction, by far, with respect to Rosemary is what caused and attracted her second Zapruder film documented reaction, that was a much, much faster, most likely impulsive reaction, that Rosemary displayed in an extremely rapid westward head snap that we can see with her head snap concluded with her very suddenly facing a line of sight aligned directly towards Mr. Abraham Zapruder and the grassy knoll picket fence corner location. In 2001 while researching individual Zapruder film frames between Z-190 and 223, a second extremely fast, Rosemary Willis head snap became evident to me that had gone completely un-noticed and government investigations un-reported by dedicated researchers and "official" investigators since the assassination 38 years prior. Rosemary’s second head snap reaction directly towards the grassy knoll picket fence location at and after Zapruder film frame Z-214 is an important, very primary and very key consideration that carries infinitely more potent and stronger weight than her, measurably, much slower and leisurely first reaction seen earlier from frames Z-190 to 213. During my writing a November 2001 JFK assassination Internet newsgroup posts thread, I was closely examining very clear Zapruder film complete frames that also reveal for us the long hidden “between-the-sprocket-holes area” recorded images. I was comparing, contrasting, and precisely measuring considerations that are documented in the Zapruder film frames around Z-219. Mr. Zapruder and the grassy knoll is provided for you in .GIF format, and downloadable here. At Z-213, just after Life Magazine's "accidental" film frames destruction caused by its employees to several key Zapruder film frames, Rosemary is clearly seen wearing her long red skirt and her white, hooded coat. During the attack, she was wearing her coat's head hood up and around the sides, top, and back her head. Zapruder film wise at that same instant, Rosemary is seen in the far left film between-the-sprocket-holes area of frame Z-213, standing just within the Dealey Plaza "North Infield" grass with the sun behind her (the sun was located Zapruder film rightward), and she was located close, and to the back and left of, the presidential limousine. What immediately became evident is that starting at Z-214, Rosemary very, very rapidly snaps her head westward to her left approximately 90 to 100 degrees within only three Zapruder frames (three Zapruder frames equals a microscopic, ultrafast 0.16 second). Rosemary was then directly facing the grassy knoll. An avi-formatted animated Zapruder film frames Z-213 to 222 segment that details for us Rosemary's very rapid head snap westward directly towards the grassy knoll is provided for your downloading and viewing in-motion here (in .AVI format), and here (in .GIF format). I strongly recommend that you closely watch this unenhanced, clear, magnified, animated clip. Rosemary's 90 to 100 degrees ultrafast head snap -- away from her facing the far western half of the Texas School Book Depository’s south face -- and that ended within only 0.16 second with her facing directly towards the grassy knoll -- is the equivalent head snap rotational speed of 549 to 610 degrees per second. (Equaling an extremely fast head snap speed approaching two "Exorcist" movie like, complete head rotations around her neck per second. Rosemary's extremely rapid head snap speed also determines for us to a certainty that Rosemary's ultrafast head snap was attracted as an involuntary and impulsive response reaction to something very external to her. To feel and precisely confirm for yourself the very rapid speed of how very fast her impulsively attracted head snap response truly was, simply, try snapping your head 90 to 100 degrees within one-sixth of a second. Rosemary's ultrafast head snap speed directly towards the grassy knoll is also the fastest head snap speed documented by a standing witness that is seen in all of the attack sequence films. that a shot did originate from behind Mr. Zapruder. Examining closely with an eye for details, we can clearly see that just prior to, and, up to frame Z-214, Rosemary's head is seen in the Zapruder film to be in a 90-degrees, left side profile, possibly even a few degrees more, relative to Mr. Zapruder's camera lense line of sight perspective to her. We can clearly see that her coats head hood is facing film frame leftward, towards her anatomical right, and her head appears to be parallel to the ground, and, importantly, we cannot see any of her head hood facial opening, at all, at that instant. The following diagram here details the found Harper skull fragment trajectory projected straight back through President Kennedy's head location at Z-313, projected further straight back to the Depository, and intersects the Depository very close to the exact same sixth floor west open window that Rowland watched the second, rifle armed assassin in. The diagram includes an inset photo captured from the, Warren Commission-apologists, supposed, "lone-nut" "snipers lair" Depository sixth floor farthest east window on 11-27-63 by the Secret Service on which is precisely indicated in red the location of known attack evidentiary artifacts. NOTE: the very wide trajected angle of the path of the Harper skull fragment away from President Kennedy's Z-313 location (the red line), as seen when looking/shooting from the commission-apologists, supposed, "lone-nut" "snipers lair." In reality the Harper skull fragment trajected path aligns nearly perfectly straight if it was actually fired from a farthest west window.... exactly from where Rowland watched a rifle-armed assassin. 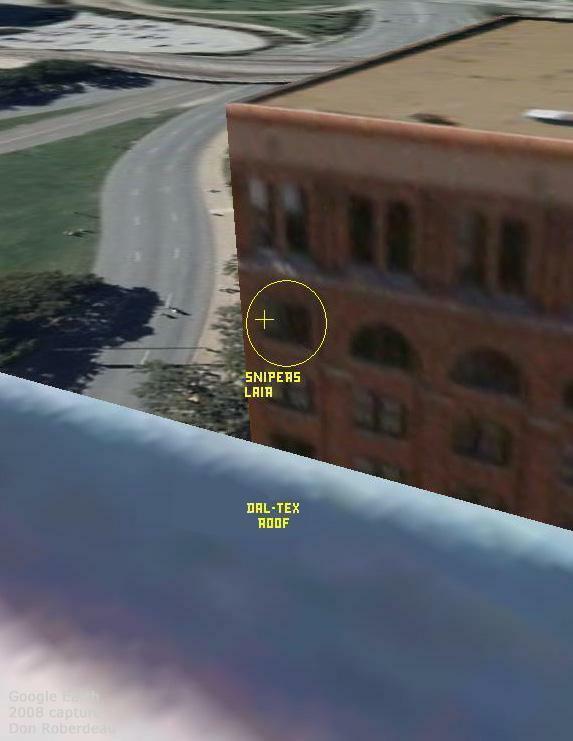 Also included on the diagram is a zoomed in section of the photo snapped by Tom Dillard revealing for us the Depository south face, sixth floor, west open window that captured a person staring outward into the kill zone within seconds after the attack ended. (The solid red, larger, ellipse seen near the grassy knoll picket fence corner is the approximate location where nine attack witnesses were attracted to see gun smoke briefly lingering under the trees wind slowing foliages, while several additional witnesses smelled gun smoke 61’ to 80’ below the Depository’s sixth floor at ground level). It is documented by 11-22-63 Dallas weather officials and films and photos captured during the assassination that the wind was blowing north-north-eastward; = blowing from the Triple Overpass bridge, TOWARDS the Texas School Book Depository. The brightness and contrasted animated clip of the Dillard photo that reveals the man in the Depository’s sixth floor, west, open window staring out into the kill zone is available for you here. At Z-214 while standing stopped and, importantly, nearly motionless, instead of facing the Depository’s southeast corner, in reality, Rosemary Willis's head is facing much closer to the southwest corner of the Depository and her head appears to be facing level (at Z-214, Rosemary's head was not facing the Depository’s southeast corner commission-apologists, supposed, "lone-nut" "snipers lair" window ~ as Warren Commission-"lone-nut"-apologist-and-plagiarist Gerald Posner and some Warren Commission-apologists have, deliberately and inaccurately, utterly failed to foist upon The People). .... away from her head facing level at the Depository, to her head now facing almost exactly directly at Mr. Zapruder, and also nearly directly facing the grassy knoll picket fence corner location that was also nearly directly aligned behind Mr. Zapruder as seen from Rosemary’s line-of-sight perspective. The fifth Polaroid photo captured that day by very close attack witness Mary Moorman has been calculated to being time stamped captured between Zapruder frames 315 and 316. 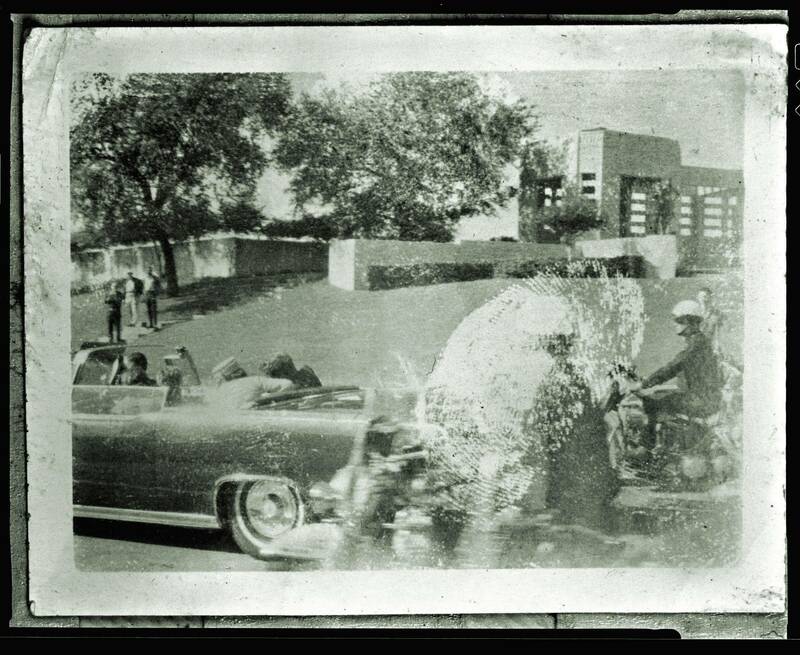 In the "Moorman photo", we can see some of the severe damage to President Kennedy's head, with the remnants of the explosive blood spatter cloud still in the air. Visible in the Moorman photo background is the grassy knoll picket fence. In the exact same grassy knoll picket fence location where the United States House Select Committee on Assassinations scientifically determined that an assassin fired a shot from, there appears to be seen the hatted head top of a person, but, in photos and film frames captured mere seconds later by other witness photographers and filmers, that hatted person has quickly left that exact same grassy knoll picket fence location. Rosemary's head accelerates through her rapid three frame head snap westward directly towards Mr. Zapruder, directly towards the grassy knoll, and directly towards the picket fence assassin, and her head snap is mostly completed by Z-217. Rosemary's head snap speed directly towards the grassy knoll is the fastest head snap speed documented by any standing witness that is seen in all of the attack sequence films. Significant, in my humble opinion, and also viewed as very significant among the many long time and dedicated JFK assassination colleagues and researchers. Rosemary also exhibits a westward shoulders/torso movement shift in her immediate post head snap Z-217 to 223 frames. There are particularly clear frames of her at Z-219 and 221 with her head still pointed even more towards the west and the grassy knoll, and it appears to me that her hands and upper torso posture has continued to shift very slightly, most likely as a follow up, trailing involuntary reaction by her other body parts that were synergized from her head snap a micro-second after her ultrafast head snap westward. By Z-222 and 223, Mr. Zapruder has panned Rosemary's image very close to the far left edge of the film frame's between-the-sprocket-holes area. Very importantly, Rosemary stated on November 8, 1978 to the investigators for the United States House Select Committee on Assassinations (hereafter abbreviated "HSCA"), that while she was directly facing the grassy knoll, she watched a person whose movement, in her words, "disappear the next instant." What do you think involuntarily attracted her reaction of her ultrafast head snap to the west, and directly towards the grassy knoll picket fence assassin location so very, very rapidly, and at that exact same instant? I am now especially interested in the fact that Rosemary's ultrafast head snap westward, directly towards the grassy knoll follows within only a microsecond the very same Dallas Police Department radio transmitted and dictabelt audio tape recorded grassy knoll gunshot that the House Select Committee on Assassinations scientifically confirmed and that Dr. Donald Thomas has further researched. After his reading this same research report with regard to Rosemary Willis that you are reading, in his book-canard, "Reclaiming History," (2007) a "lone-nut"-apologist and prosecution lawyer, Mr. Vincent T. Bugliosi, Jr. has tried (yet, he failed) to spin his opinion of Rosemary's Zapruder film documented ultrafast second head snap directly towards the grassy knoll. Unfortunately for Mr. Bugliosi (and the steadily-vanishing, transparently living-in-denial, desperate habits of the minority of other commission-apologists)----and, much more so, unfortunately for and against the honest benefits for the reader of his book-canard----in Mr. Bugliosi's impotent "critique" he deliberately chose to not provide for his reader all of the most important and very key considerations that are clearly detailed above within this research report with respect to Rosemary's ultrafast second head snap directly towards the grassy knoll.... One very important consideration that he "failed" to mention for his reader was the sheer very fast speed of her head snap, that we can simply measure to be nearly two (2) "Exorcist"-film-like, complete, head rotations, per second. Close assassination witness, Rosemary Willis (her name was incorrectly HSCA written as "Rose Mary Willis"), in her November 8, 1978 statements to investigators for the United States House Select Committee on Assassinations. Rosemary’s statements were buried in the HSCA’s last volume, number 12, on page 7, and are also documented and readable within the Internet link provided for you here, "Presence of Possible Gunmen on the Grassy Knoll." Importantly, from Rosemary’s precise location, if her eyes were approximately 4.5’ above the grass that she was standing on, when she rapidly snapped her head and then was facing the grassy knoll picket fence corner location where the seemingly human shape was located that is visible in the Mary Moorman # 5 Polaroid with that person’s head above the 5.0’ tall picket fence top, Rosemary’s eyes were exactly 0.7’ above that same picket fence top location (there was a cement “retaining wall” located on the grassy knoll that was on that same line-of-sight between her and the picket fence, but, the top of that cement wall was also measured on professionally surveyed plats at a height-above-sea-level that was exactly 2.0’ lower than Rosemary’s eyes). Mr Zapruder was photographing the President at the instant he was shot. According to Mr Zapruder the position of the assassin was behind Mr Zapruder. Note: Disregard personal scenes shown on Mr. Zapruder's film. Mr. Zapruder is in custody of the "master" film. TWO prints were given to SAIC Sorrels, this date. Mr. ZAPRUDER: I thought I heard two, it could be three, because to my estimation I thought he was hit on the second--I really don't know. The whole thing that has been transpiring--it was very upsetting and as you see I got a little better all the time and this came up again and it to me looked like the second shot, but I don't know. I never even heard a third shot. Mr. LIEBELOR: You didn't hear any shot after you saw him hit? Mr. ZAPRUDER: I heard the second--after the first shot--I saw him leaning over and after the second shot--it's possible after what I saw, you know, then I started yelling, "They killed him, they killed him," and I just felt that somebody had ganged up on him and I was still shooting the pictures until he got under the underpass--I don't even know how I did it. And then, I didn't even remember how I got down from that abutment there, but there I was, I guess, and I was walking toward--back toward my office and screaming, "They killed him, they killed him," and the people that I met on the way didn't even know what happened and they kept yelling, "What happened, what happened, what happened?" It seemed that they had heard a shot but they didn't know exactly what had happened as the car sped away, and I kept on just yelling, "They killed him, they killed him, they killed him," and finally got to my office and my secretary--I told her to call the police or the Secret Service--I don't know what she was doing, and that's about all. I was very much upset. Naturally, I couldn't imagine such a thing being done. I just went to my desk and stopped there until the police came and then we were required to get a place to develop the films. I knew I had something, I figured it might be of some help--I didn't know what. As to what happened--I remember the police were running behind me. There were police running right behind me. Of course, they didn't realize yet, I guess, where the shot came from--that it came from that height. Mr. LIEBELER: As you were standing on this abutment facing Elm Street, you say the police ran over behind the concrete structure behind you and down the railroad track behind that, is that right? Mr. ZAPRUDER: After the shots? Mr. ZAPRUDER: Yes--after the shots--yes, some of them were motorcycle cops--I guess they left their motorcycles running and they were running right behind me, of course, in the line of the shooting. I guess they thought it came from right behind me. Mr. LIEBELER: Did you have any impression as to the direction from which these shots came? Mr. ZAPRUDER: No, I also thought it came from back of me. Of course, you can't tell when something is in line it could come from anywhere, but being I was here and he was hit on this line and he was hit right in the head--I saw it right around here, so it looked like it came from here and it could come from there. Mr. LIEBELER: All right, as you stood here on the abutment and looked down into Elm Street, you saw the President hit on the right side of the head and you thought perhaps the shots had come from behind you? Mr. LIEBELER: From the direction behind you? Mr. ZAPRUDER: Yes, actually--I couldn't say what I thought at the moment, where they came from--after the impact of the tragedy was really what I saw and I started and I said--yelling, "They've killed him"--I assumed that they came from there, because as the police started running back of me, it looked like it came from the back of me. If Rosemary's ultrafast head snap directly towards the grassy knoll actually started between Z-214 and 215, or during the exposure of Z-215, then her quantitative equivalent head snap average speed could have been as fast as 915-degrees per second (more than two "Exorcist" movie-like head revolutions per second), which is approximately as fast as the same head snap speed of presidential limousine Secret Service driver, William Greer, just before President Kennedy's head initially exploded. In photos and films captured right after the attack, Depository west window units #11 and #12 were open approximately thirty percent and forty percent, respectively. Only a couple of degrees difference in trajectory to either side of this theorized trajectory was west open window unit #10 (one-hundred percent open), #13 (one-hundred percent open), and #14 (one-hundred percent open). Due to each Depository window unit actually consisting of two separate, framed window sashes (one stationary window half that was above a lower, vertically moveable window half), the maximum a window unit's lower window is considered "open" is 100%. West window unit #13 was the same window that Dealey Plaza attack witness Arnold Rowland commission-testified that from Rowland's line of sight he watched at 12:15 PM a rifle-armed assassin who was standing while backed 5' away from (northwest of) that exact same open window. Dealey Plaza witness, Arnold Louis Rowland, testimony to the Warren Commission, volume 2, page 165. 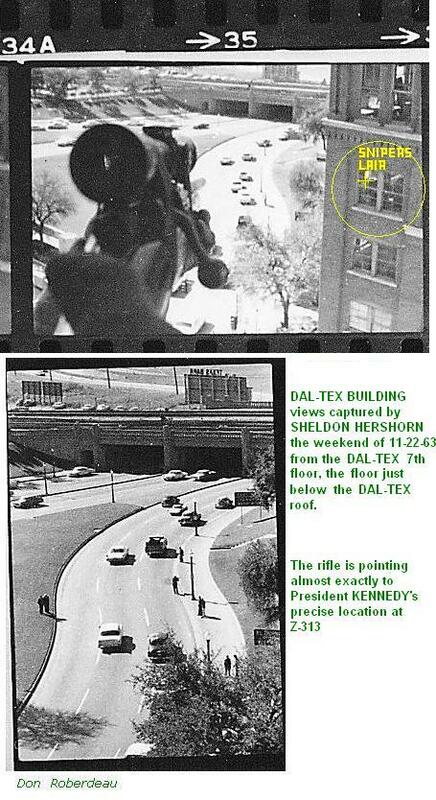 At the instant that "Dallas Morning News" photographer Thomas Dillard captured this photo of the man in the sixth floor far west open window staring out into the JFK kill zone, seemingly downward towards Dillard, estimates time stamp the Dillard photo to being snapped between 5 and 30 seconds after the president's head first exploded near the end of the attack. Mrs. HILL: That's right, and I talked with this man, a Secret Service man, and I said, "Am I a kook or what's wrong with me?" I said, "They keep saying three shots---three shots," and I said, "I know I heard more. I heard from four to six shots anyway." He said, "Mrs. Hill, we were standing at the window and we heard more shots also, but we have three wounds and we have three bullets, three shots is all that we are willing to say right now." Mr. SPECTER: Now, did that Secret Service man try to suggest to you that there were only three shots in any other way than that? Mrs. HILL: That's all he said to me. He didn't say, "You have to say three shots"---he didn't tell me what to say. Mr. SPECTER: He didn't try to intimidate you or coerce you in any way? Mrs. HILL: No; that's all he said. Mr. SPECTER: All right. Go ahead and tell me what you told Mark Lane. Mr. SPECTER: Do you know who that Secret Service man was, by the way? Mrs. HILL: No; I don't. I don't know--not any name that day except Decker and the President. Mr. SPECTER: All right, go ahead and tell me everything else you said. Mrs. HILL: Then, he asked me, I was asked, did I know that a bullet struck at my feet and I said, "No; I didn't." And he said, "What do you think that dust was?" And I said, "I didn't see any dust." And I told Mark Lane that the Times Herald did run a picture in the paper of a concrete scar where a bullet had hit right where we were standing, which is evident to anybody that had an issue of the Times Herald. Mr. SPECTER: Did you see that concrete? Mrs. HILL: I didn't go back down there. Mr. SPECTER: Do you know whether or not a bullet did hit that concrete? Mrs. HILL: As I say, I saw the picture in the newspaper. Mr. SPECTER: Aside from seeing it in the newspaper, do you know anything about that? Mrs. HILL: No; other than what the man said he saw out of the window of the courthouse, the Secret Service man said "and it struck at my feet," other than that--I don't know. Witness Ed Hoffman, waiting for President Kennedy to pass under him from atop a bridge near the Stemmons freeway entrance ramp about 175 yards west of the grassy knoll picket fence, could clearly see the north, back side of the picket fence. The grassy knoll assassin then turned west, towards Hoffman, and trotted west right along the line of the grassy knoll picket fence north side (the attack sequence film captured by Orville Nix details what may be the crouching head top of the grassy knoll assassin, as he trotted westward close to and behind the picket fence). As the assassin neared the west end of the grassy knoll picket fence the assassin tossed his rifle to an accomplice who was wearing a railroad workers type outfit (The assassin then turned northward and moved away from the grassy knoll picket fence). The accomplice quickly moved to hide himself behind a close by, large, tall railroad utility box where the accomplice quickly disassembled the assassins rifle apart into two shorter pieces, then hid the rifle pieces down into his tool box or carry bag. The accomplice then moved north, directly away from the grassy knoll, which may have been the same accomplice that witness J.C. Price also watched moving north while carrying something, and may very well have also been the same man that was seen by an un-named witness running northward near the railroad tracks and then the un-named witness alerted Dallas Policeman Joe Foster about the running man. Rosemary starts to slow her trotting (approximately Z-175 to 180)…. Rosemary's feet come to a stop (approximately Z-190)…. ….From Z-203 to 207 Rosemary rapidly turns her head about 20-degrees to her anatomical right----more towards the Elm/Houston Streets intersection where is located the Depository and the Dal-Tex Building right next to the "snipers lair." Mafia convicted felon Jim Braden, a.k.a. Jim Brading and Eugene Hale Brading, was soon arrested inside of, then, he was soon released by *someone(s)* in the Dallas police department. 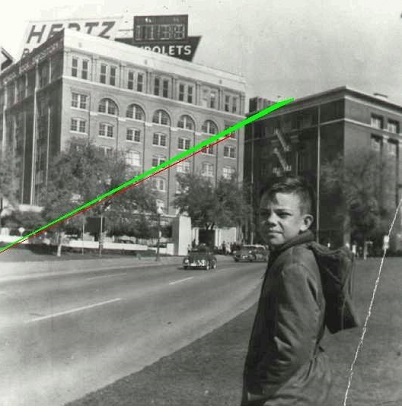 (the 11-22-63 Dallas Sheriff, Bill Decker, had arrested Braden-Brading in Dallas in 1952) The Dal-Tex is located right next to across Houston Street from the School Book Depository. It is interesting to see that an assassin firing from the roof or a high floor of the Dal-Tex Building (of which there is no record the Dal-Tex Building was ever methodically searched despite mafioso Braden's presence and arrest) that in a military operation ---- a.k.a. the MILOP ---- it easily could be deliberately pre-planned to select a key roofline west face, very precise location point whereby any bullet trajectory(ies) would pass very, very close to the Depository's, supposed, "lone-nut" "snipers lair" window bullet trajectories, and which would nearly exactly duplicate - - - - close enough for "government work" - - - - the very same vertical, horizontal, and lateral bullet angle trajectories into President Kennedy for the military-controlled medical autopsy that would, inevitably, be known ahead of time to have to follow the assassination. Recall that at Z-190 to 199 the live oak, commission-apologists "magic-limbed-ricochet-tree" still hid the president from view by anyone targeting/shooting from the commission-apologists, supposed, "lone-nut" "snipers lair", and, during Z-180 to 200 Mr. Zapruder imparted his largest pre-313 hand jiggles onto his movie camera causing significant film blurs, possibly indicating his physical reaction to his hearing blasts/shock waves and being startled (very importantly, Mr. Zapruder also stated that he saw President Kennedy react to being shot just before the president was hidden from his view by the "Stemmons" sign starting at Z-205). Recall also that attack close witness/photographer, Hugh Betzner, stated to the Warren Commission that he remembered hearing a blast or shock wave only after capturing his Z-186 time stamp documented photo. The fact of the matter is before Z-214, Rosemary was definitely not facing the Houston/Elm streets intersection at Z-214, as Posner and other Warren Commission-apologists have failed to foist upon The People. Close assassination witness, Rosemary Willis (her name was HSCA written as "Rose Mary Willis"), November 8, 1978; her statements to investigators for the House Select Committee on Assassinations, volume 12, page 7, also documented within the Internet link provided for you here, "Presence of Possible Gunmen on the Grassy Knoll"
Visual Report: “The First Bullet Impact into President Kennedy: While JFK Was Still Hidden Under the 'Magic-limbed-ricochet-tree' "